Last weekend I spent a few hours making a new wreath for the front door. Out with the bunny in with the flowers. I had originally planned to use just the burlap flower picks but then it just wasn’t enough color so I glued them to these yellow flowers that I had bought for my daughter’s room. Oops!! They looked much better with the pop of yellow and they sort of reminded me of sunflowers. I am in Kansas (the sunflower state in case you didn’t know) so it turned out perfect. My yarn is all sorts of crazy. 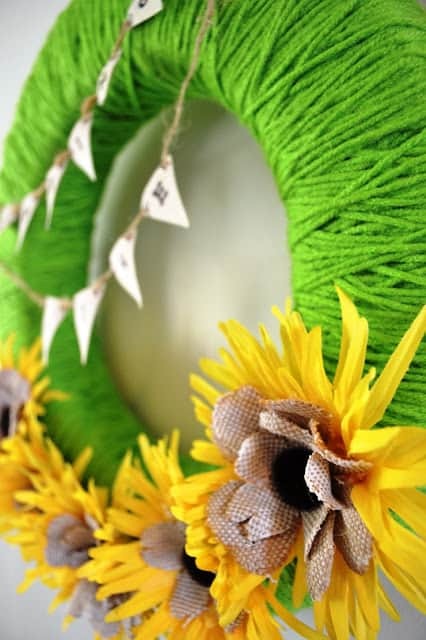 Most of the yarn wreaths I have seen are nice and smooth looking but I just thought the “messy” look just made it look that much more like grass. 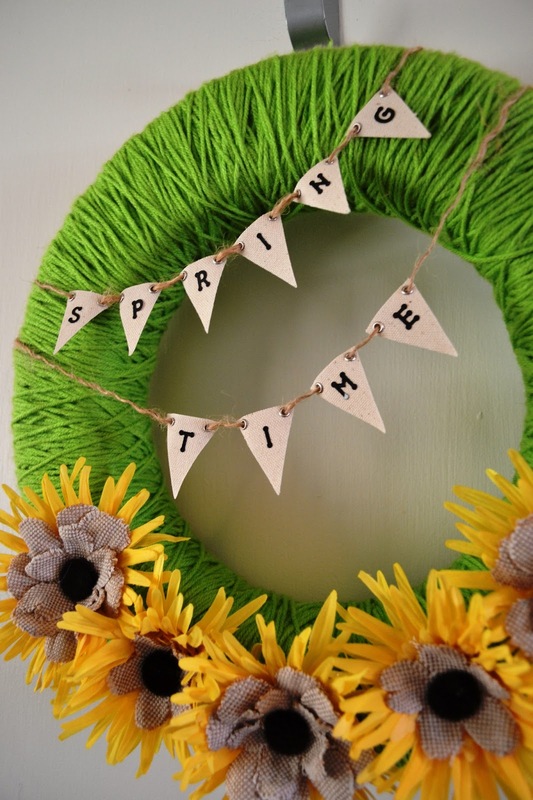 Did you Spring up your front door? 8 Tips to Survive Allergy Season! I love how cute this is! 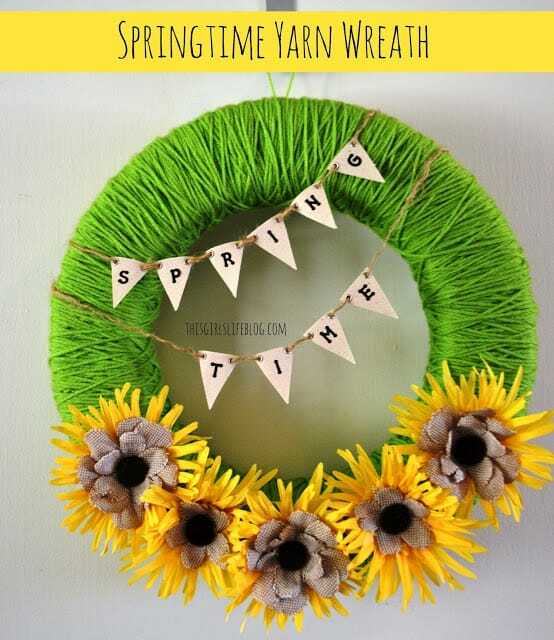 And it’s a nice alternative to Easter décor after Easter. Seriously adorable. I love the yellow behind the flowers. And the bunting is perfect. So springy I can almost believe Spring is on the way. Indiana has been dragging its feet on the whole spring thing. Stopping by as part of the UBP. Love your wreath. I love having a wreath on the door and I’ve always just picked them up at Walmart. I might just have to think about making my own now. I’m stopping by from the Blog Party. Your wreath is super cute…I’m embarrassed to say that the wreath my kids made for Christmas is still hanging on our front door (hangs head in shame)! The bunting was a giddy excited find. I thought I was going to have to make those things on my own but Hobby Lobby to the rescue. Love that store! 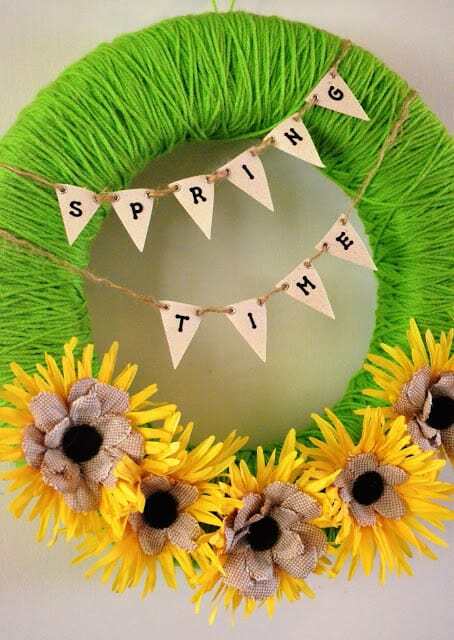 Love the bright colors and it would love perfect on my door. I love this! And I think you’re right about the messy yarn, it adds to how fun the wreath is! 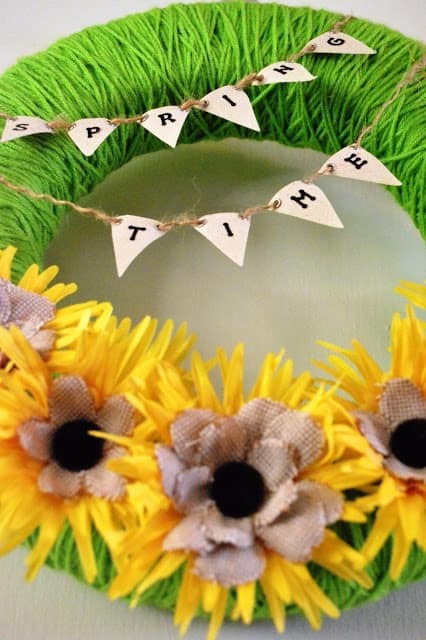 Since Easter came so early this year I kept my front door springy with a welcome wreath with plastic eggs on it. 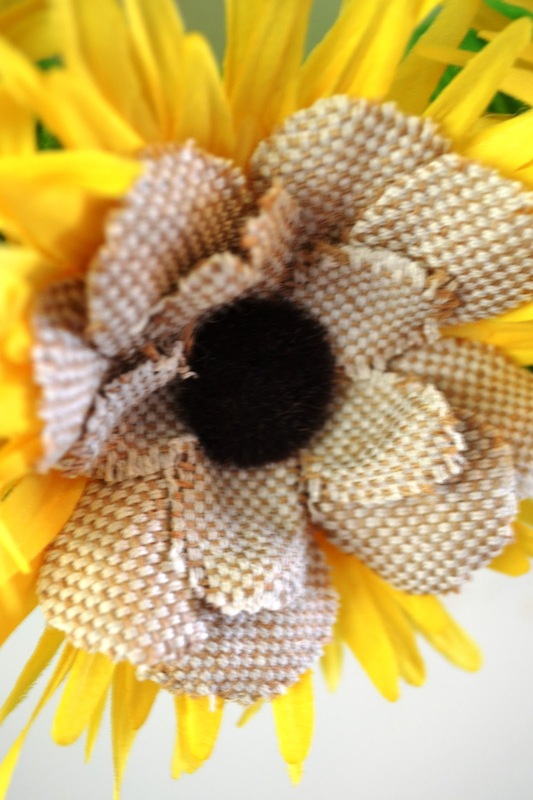 I love the messy yarn look…it’s textural! Your flowers are layered and interesting as well. Featuring this at my wreath board over at Pinterest, and at Creative Juice tonight. Thanks Sharon! Yeah they have the premade banners in smalls ones, medium ones, large ones. Another cute way to make them would be using washi tape and making little banners.